A delicate, sterling silver Girls ID Bracelet, stylishly embellished on the right hand side with a cut-out heart and personalised with the name of your princess. As an approximate guide, this bracelet will fit girls 3 - 5 years old. 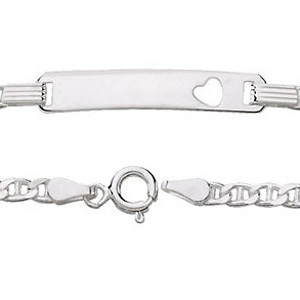 Please Note: The turn-around time for this sterling silver Girls ID Bracelet is 2 - 3 weeks.